Showing 1 - 20 of 599 results. 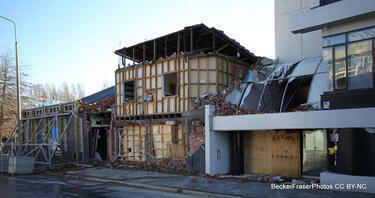 Photograph captioned by BeckerFraserPhotos, "195 Armagh Street". 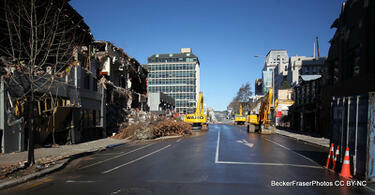 Photograph captioned by BeckerFraserPhotos, "195 - 199 Armagh Street". Photograph captioned by BeckerFraserPhotos, "Detail of Peaches and Cream, 132 Manchester Street". Photograph captioned by BeckerFraserPhotos, "129 Manchester Street". 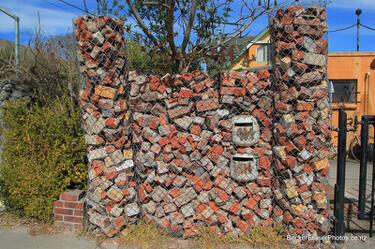 Photograph captioned by BeckerFraserPhotos, "Bricks on the footpath from someone's wall. 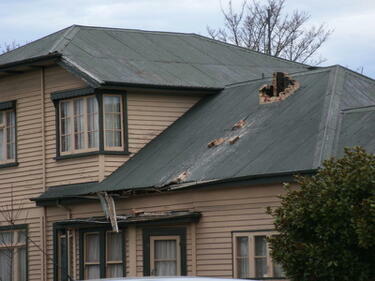 Winchester Street, Lyttelton". Photograph captioned by BeckerFraserPhotos, "404 Gloucester Street". 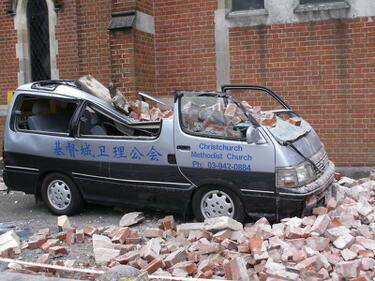 A photograph of a van from the Christchurch Chinese Methodist Church. 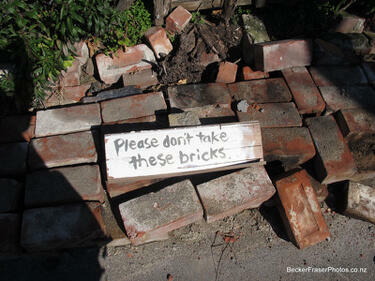 The van has been crushed by fallen bricks. 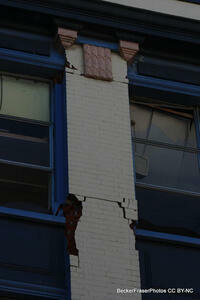 A photograph of a collapsed brick chimney. 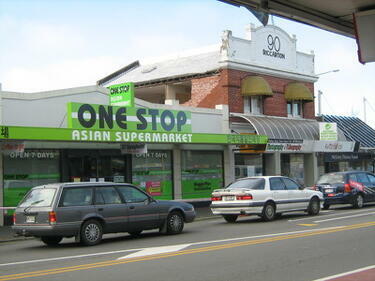 A photograph of the earthquake damage to 90 Riccarton Road, next to the One Stop Asian Supermarket. 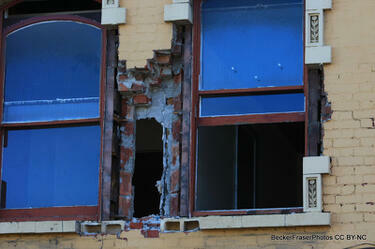 The brick wall of the building has crumbled, exposing the inside rooms. A photograph of a dusty monitor in an earthquake-damaged building on Poplar Street taken during the Residential Access Project. 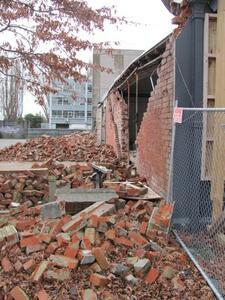 The Residential Access Project gave residents temporary access within the red-zone cordon in order to retrieve items from their homes after the 22 February 2011 earthquake. 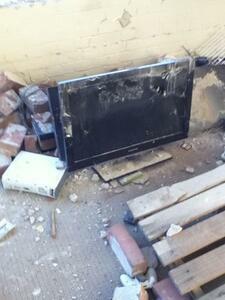 Dislodged bricks can also be seen around the monitor. 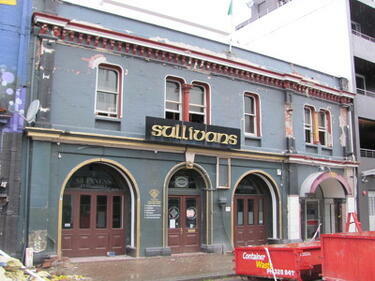 A photograph of the earthquake damage to Sullivans Bar and Restaurant on Manchester Street. 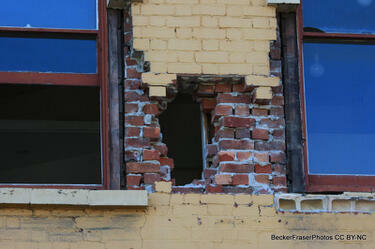 Brickwork around the windows of the top storey has crumbled. Two skips sit outside for the collection of rubble and other debris. A photograph looking west down Hereford Street from the intersection with Manchester Street. 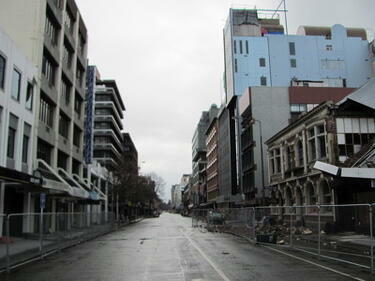 Wire fencing has been placed on both sides of the street to cordon off earthquake-damaged buildings. 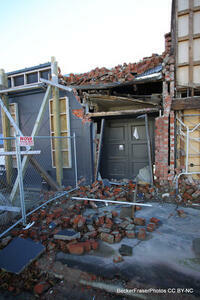 To the right, bricks have spilled across the road and footpath. 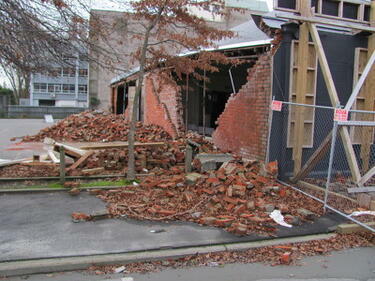 A photograph of a partially-collapsed brick wall and piles of bricks in a car park on Armagh Street. 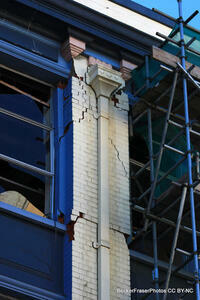 Wooden bracing is supporting one side of the building. 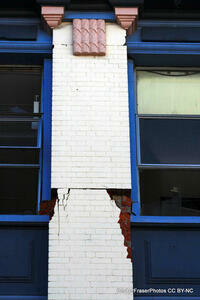 A photograph of an earthquake damaged building on Armagh Street. 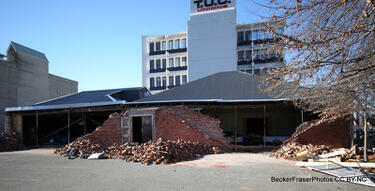 The bricks walls have partially collapsed, and the bricks have fallen onto the car park in front. 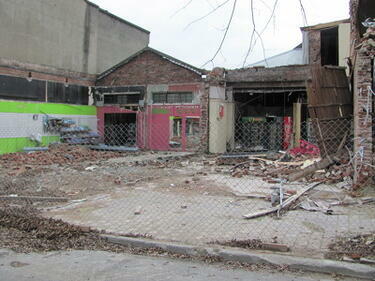 A photograph of the partially-cleared site of a demolished building on Colombo Street. Bricks and some building rubble still remain.